Back in 2013 we asked you to merge the past, present and future of our city in imaginative ways. It could be a drawing, painting, manipulated photograph, or even a map. 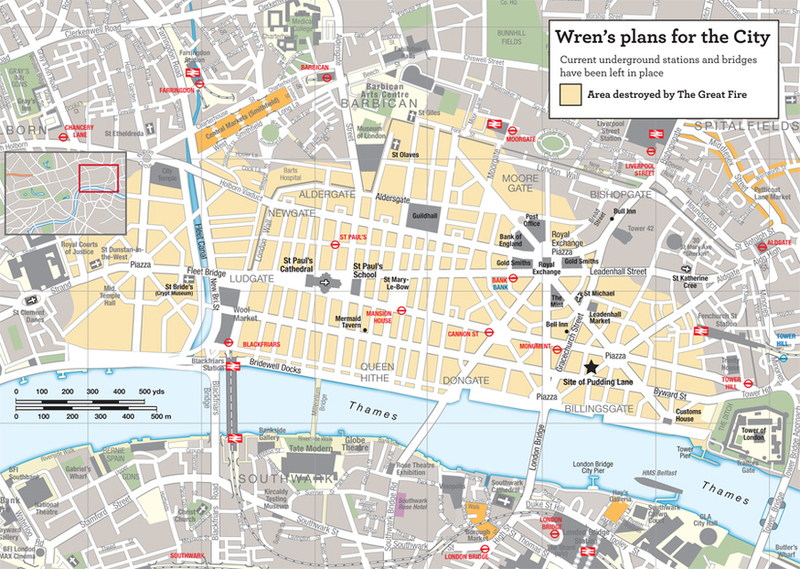 James Macdonald sent us this map of the Square Mile, and we love it. At first glance, it looks like any humdrum professional map of the City, but look closely. The financial heart of the capital seems now to be based on a grid system, with long boulevards stretching from Ludgate to Leadenhall and Tower to Barbican. The River Fleet has re-emerged to the west, and Fleet Street has become a piazza, with new arteries radiating away. The map is a combination of the modern City, including transport links and newer landmarks, and famous plans by Christopher Wren, drawn up in the wake of the Great Fire in 1666. Wren's scheme was never realised, as land-owners were quick to rebuild their property and businesses along the pre-fire medieval street pattern, which still largely survives today. But this is a glimpse of what might have been. The map was originally put together by James for Insight Guides, and you can learn more about the inspiration here.